A permanent residence through a job offer in the U.S. currently totals about 80 percent of all the cases in our Law Office. Their great majority consist of clients with a Master’s degree, temporarily present in the U.S. on visitor’s and student visas, or residing abroad. Cases such as these have recently grown longer to complete, but in general, they do not take more than two years. Persons in the lower employment preferences can expect a little longer wait in visa queue, but not by much. The fundamental element of an employment sponsorship is a bona fide job offer in an occupation, for which a client is qualified based on his or her education or experience. Such a job offer is evaluated by Mr. Bloch through a prism of approvability of an employment petition. The sponsor, a future employer, must be able to prove its ability to pay a prevailing wage in the proffered position, from the day the case begins until the very end. Mr. Bloch treats the potential sponsors with due respect, but without leniency. If a sponsor is not willing to show its financial documents, or it appears that it does not meet the required qualifications, the client has only one choice: to look for a different sponsor or to look for a different attorney. The process of employment sponsorship begins in the same way in all the occupational preferences: with a vigorous recruitment campaign by the sponsor. It lasts for two months and has as a goal of convincing the U.S. Department of Labor, that the job offer extended to a sponsored foreigner will not negatively affect the American labor market and that there are no willing or adequately qualified Americans for this position. 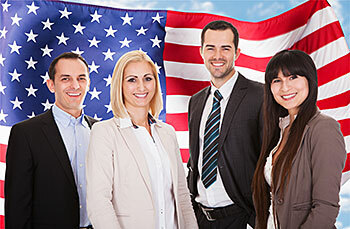 After the approval of the application at the U.S. Department of Labor stage, (with the Internet-based PERM system, it takes from two to several months), the sponsorship moves into the orbit of the U.S. Citizenship and Immigration Services. This particular Office judges the financial qualifications of the sponsor and the occupational qualifications of the beneficiary. In the second preference, requiring at least a Master’s degree to perform a job, the immigrant visas are immediately available. This stage may be combined with a concurrent application for Adjustment of Status, for clients who are physically (and legally) in the United States. In practice, it means that in just a few months after an application is accepted by USCIS, such clients (and employment sponsorship automatically covers the entire immediate family of the principal beneficiary) receive official permission to work in the U.S. They are quite often waived from a personal interview, before their case is approved. Persons in the lower employment preferences, after the approval of their case by U.S. Department of Labor and their employment petition by the USCIS, must wait in a visa queue (which is governed by the “Visa Bulletin”, published monthly by the U.S. Department of State), before they are able to file the final application for permanent residence and to receive an authorization to work, while awaiting the decision.